In medicine, as in all other areas of human endeavour, we cannot understand "where we are" if we forget "from where we came". In our section "Rheumatology through the centuries" we invite experts to look back on discoveries that have shaped the course of rheumatology such as: "The discovery of the rheumatoid factor. I. Eric Waaler" by J.B. Natvig & O. Tönder and "II. Rose, Ragan, Pearce and Lipman" by C.L. Christian (Clin Exp Rheumatol 1998; 16: 340-9); "The L.E. cell and its legacy" by E.M. Tan, who reflects on the serendipidous discovery by the hematologist M.M. Hargraves (Clin Exp Rheumatol 1998; 16: 652-8); and "A humble gentleman at 100", an essay by F.A. Wollheim on Henrik Sjögren, who first identified the syndrome that bears his name (Clin Exp Rheumatol 1999; 17: 648-52). Finally... an exclusive gift for our print subscribers: since 2002 Clinical and Experimental Rheumatology has been offering in every print issue a full-page, colour reproduction, suitable for framing, of an antique miniature on the subject of rheumatology. 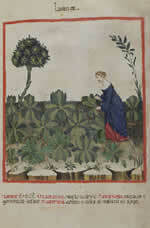 Reproduced with the permission of the Biblioteca Casanatense (Rome) by concession of the Italian Ministro per i Beni e le Attività culturali from the late 14th century manuscript herbal Theatrum Sanitatis (f. LXXIII, Ms. 4182). A certain monk-physician told me that a friend of his was afflicted with podagra and was under his care for a long time. Galen came to him in a dream and told him: take coloquintide and powder with bdellio, mix with cabbage water, marjoram and place [in the form of a poultice or ointment on the affected area] while it is still warm. He prepared this treatment the very next day and [his patient] was cured of his cold podagra. Reproduced with the permission of the Biblioteca Casanatense (Rome) by concession of the Italian Ministro per i Beni e le Attività culturali from the late 14th century manuscript herbal Theatrum Sanitatis (f. LX, Ms. 4182). The reproduction of this illustration in any form without the permission of the copyright holder is strictly forbidden. The salves that impede the flow must not be placed over the joints until the body has been purged. Then one must put this medicine over the joints to relax the organ and close the pores so that they do not receive many superfluous substances ... but I want to describe only the specific treatments. An ointment that retains the substance, soothes the pain, heals the apostemus, cools and comforts the organ. Take: spodio, camphor, memithe, acacia ana 3.i, opium ana quarta.3, mix with solatro or lettuce or portulaca and put in place. 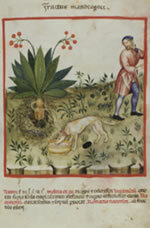 The miniature has been reproduced with the permission of the Biblioteca Casanatense (Rome) by concession of the Italian Ministro per i Beni e le Attività culturali from the late 14th century manuscript herbal Theatrum Sanitatis (f. LI, Ms. 4182). One must descend just eight stairsteps. [The waters] restore the flanks, sooth pains in the womb, block menstrual flow; it is said that they help to relax stiffened muscles; restore to the head and shoulders their normal functions, are effective against stones in the vesicles and kidneys, facilitate the flow of urine. Reproduced from De balneis Puteolanis (ms. 1474, c. 18r), Biblioteca Angelica (Rome) with the permission of the Italian Ministero per i Beni e le Attività Culturali. De balneis Puteolanis represents the first known work on thermal baths to appear in Europe. 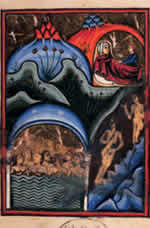 A 13th century manuscript illustrated with 18 miniatures by an artist of the Sicilian school, it describes various baths in southern Italy and their supposed curative effects. Reproduction or duplication of this illustration in any form and by any means without the permission of the copyright holder is strictly forbidden. These sweet waters restore wasted joints, reinforce the stomach, irrigate dry members, cure severe illnesses, comfort the internal organs, but have no effect on tumours of the abdomen, or on a swollen liver or spleen, I saw with my own eyes a man who had been reduced to skin and bones recover in a very short time. Reproduced from De balneis Puteolanis (ms. 1474, c. 11r), Biblioteca Angelica (Rome) with the permission of the Italian Ministero per i Beni e le Attività Culturali. De balneis Puteolanis represents the first known work on thermal baths to appear in Europe. 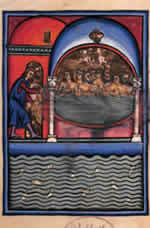 A 13th century manuscript illustrated with 18 miniatures by an artist of the Sicilian school, it describes various baths in southern Italy and their supposed curative effects.